If you like standing when you work or work from your bed then check out this Avantree Bed And Standing Desk. This is folding desk that comes in two sizes for just your computer or with a mouse next to it. 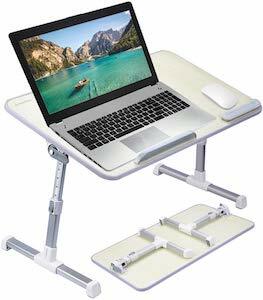 The folding desk is adjustable in hight and even angle so that you can use it on top of a table as a standing desk or on the couch, bed, or even the floor and that means you can work almost anywhere. And there are little guides on the one side so that your computer stays in place when at an angle but they are removable to become a portable writing desk. So if you want to perfect desk for working almost anywhere then come get your Avantree Bed And Standing Desk.